South Mumbai, preferably called as “South Bombay”, could be a whole other country all together, given the amazing colonial architecture, Victorian and Goth inspired buildings, historical monuments from the pre independence era. Whether you’re a SoBo couple or not, booking a wedding venue in this region of Mumbai is no less than a dream come true. What comes as part of the package while booking a venue in South Mumbai is the romance, the nostalgia and the decadence of a time in history, which will become part of your beautiful love story and it’s culmination into a lifetime bond. Couples looking to celebrate their union in the “best of the lot” venues, we have compiled a list of the most popular wedding venues in South Mumbai that can amazingly fit your likes, budget and the works. Let’s waste no time and straight dive into the nitty-gritties. 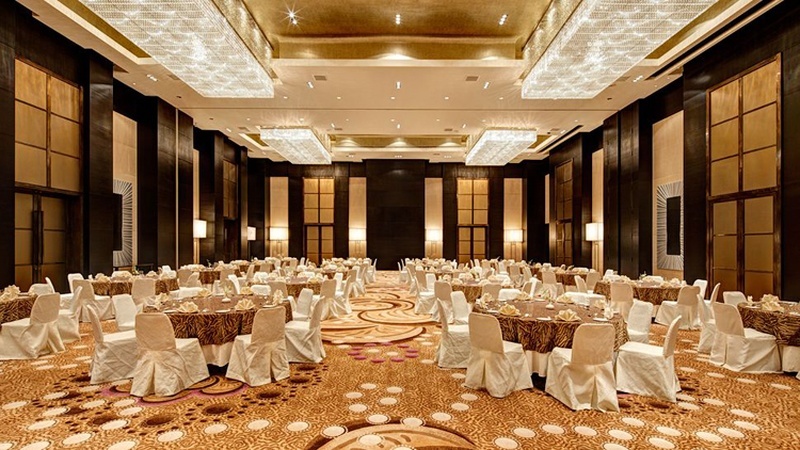 We begin our listing with the finest luxury banquet halls in South Mumbai. Blue Sea is one of the most sought after choice of soon-to-wed couples given the uber-comfort and luxurious banquet services, coupled with perfect world-class outdoor catering facilities offered by the venue. Whether you need to book this venue for your pre-wedding functions or wedding reception every event is sure to be filled with grandeur, abundance and exuberance. What does the venue offer? Listed on top of the ‘want list’ by hundreds of couples across Mumbai, this SoBo wedding venue is a reality that jumps straight out the fairytale you’ve grown up fantasizing. Most sought after venue not only for hosting pre-wedding and wedding festivities, but also product launches, award functions and cocktail parties, you know for sure that J.K. Banquets is the “this is it” site where you want to celebrate your union. This 30 year old wedding venue has been the pioneer of banquet facility that features central AC. One of the reason why this is the most popular wedding venue in South Mumbai, is that it offers Wi-Fi services that ensure your social media obsessed guests are entertained throughout the event. Easy accessibility to this venue makes it all the more favourable choice for soon-to-wed couples. Venue has tie-ups with some of the best decorators who’re updated with the latest trends in wedding décor and familiar with the each little space of the hall, ensuring your venue looks like a resplendent masterpiece. Intimate celebrations cannot get any classier than this! When hosting your wedding reception in one of the premium banqueting facility in Nariman Point, you know you will be receiving nothing less than excellent service and attention to detail. Senate Banquets has been accommodating private and corporate functions since 1997. For close and traditional wedding celebration, make Senate your ultimate choice. A swanky South Mumbai hotel located at Grant Road, Hotel Krishna Palace houses multiple banquet halls that will easily leave you confused or rather spoilt for choices. The venue can effortlessly accommodate your varying needs for pre-wedding and wedding festivities. A gem venue nestled in Dadar; Verve adds the right amount of zing to your wedding festivities with its banquet facilities and expert services. If you like it simple yet classy look no further than Verve. Are you planning on hosting a traditional Indian wedding and looking for venue in South Mumbai that serves only vegetarian cuisine and does not allow non-veg and alcohol on premises? Avsar is your knight in shining armour. How to get there: Nearest railway station is Grant Road Station. Want to show off your city to outstation guests? Then do it in style! 20 Downtown offers the best in class banqueting facility in South Mumbai that is simply out of this world. If you’re having a wedding on a budget and looking for a refined venue, 20 Downtown will help you host a memorable celebration.